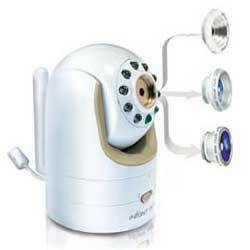 The DXR-8 Video Monitor by Infant Optics is the first baby monitor with interchangeable lens technology. Three separate lens types — Normal, Wide Angle (sold separately), and Zoom — allow you to choose the most suitable focal length and viewing angle for the specific environment, just like a professional camera system. Video is streamed realtime to a compact 3.5″ LCD color display providing a crystal clear image. The DXR-8 is packed with a roster of advanced features for added convenience: remote camera pan/tilt, infrared night vision, talk-back function, room temperature sensor, and more. This camera is an investment that grows with your family. Use a close-up lens for intimate vision of your infant, and swap for a panoramic lens when your child becomes more mobile to provide a full view of your child’s activity. Optical lenses mount on camera in seconds. Zoom Optical Lens is perfect for close-up viewing during sleep. Unlike digital zoom where software simulates an image to appear closer, the optical zoom effect does not deteriorate resolution or image clarity. Place camera far from your baby and still enjoy an effective close-up view. Wide Angle Lens (sold separately) captures the entire room, a full 170 degree panoramic view. Best for active babies and toddler — they can play and explore and you can monitor them and their surroundings. Nothing will escape your notice. 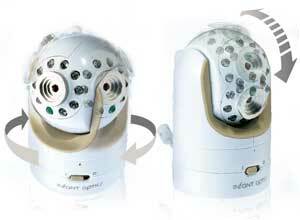 Features full range remote-controlled camera direction. Display unit shows real-time video and sound from your baby’s room, so you can see and hear everything. 3.5″ color LCD screen has crystal clear resolution and an automatic infrared night vision feature that ensures your baby is visible throughout the night. Display unit includes room temperature indicator and sound-activated LED display: with volume down, LEDs indicate the sound level in your baby’s room. Display unit provides complete remote control of the camera. 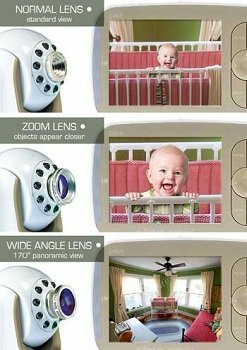 Pan and tilt the camera direction to follow your baby without disturbing them. 2.4GHz FHSS provides clear, realiable transmission, and built-in data encryption for added security. Talk-back feature allows two-way audio communication. No more dropped signals, plus outstanding range and transmission quality. Retractable antennna provides 700′ range in unobstructed conditions. Long-lasting battery provides reliable charge: 10 hours in power-saving mode, 6 hours with the display screen constantly on. Link up to four cameras in a single display unit. The DXR-8 features ‘scan mode’ which automatically cycles through cameras at 12-second intervals, providing continuous video and audio surveillance on multiple cameras. The DXR-8 comes with support & service available 7 days a week from one of the most trusted brands in home technology. Categories: All Great Gifts For Baby Showers, Essentials & Must-Haves.